I am not a morning person, but there was definitely a good reason to wake up very early on that beautiful Thursday morning. 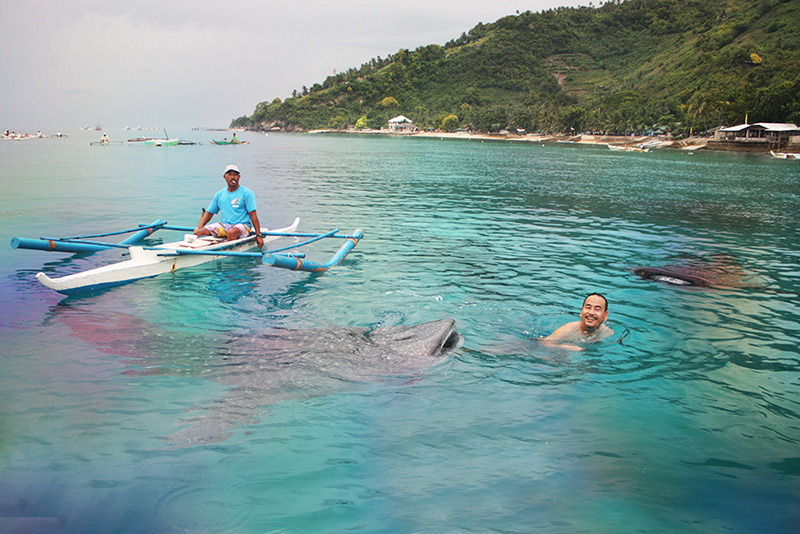 We were at Oslob, Cebu, in Barangay Tan-awan, and were scheduled for whale shark watching that day. After a quick breakfast of cup noodles, we were off to the beach. Kuya Jimmy, a barangay kagawad/konsehal and the caretaker of Friendly’s Resort where we stayed for the night, was already at the beach along with some of his friends. He told us last night that he would assist us throughout the entire process of the tour. He referred us to a boatman, who seemed to be a friend of his. We were later brought to the orientation area which is about 3 minutes away from the resort. The orientation was quick which lasted for about a couple of minutes only. At 6:30 in the morning, there weren’t a lot of tourists yet. Our boat was the first to go. We reached the spot in 5 minutes. Yes, the feeding area where tourists could watch the whale sharks or tuki to the locals is very near but deep enough at approximately 25 feet for these gentle giants to be able to swim comfortably. 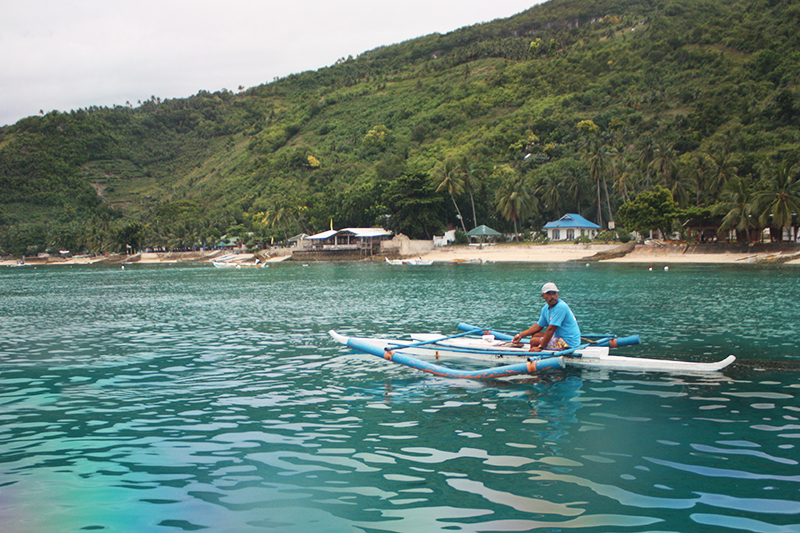 Our boatmen immediately threw krill or “uyap” into the water to be fed to whale sharks. Within seconds, he pointed to a dark silhouette slowly approaching our boat. “There is one”, he said. And as quickly as we stood up to look at what the boatman pointed to us, it’s mouth appeared. Our excitement grew. “ You may get into the water, sir” our boatman smiled. As I prepared my camera, I heard a splash and saw my friend Jim dove into the water. After a few seconds, he emerged and said excitedly,” Ang laki! ( It’s really big! )” Then we saw another one, followed by another, until Jim was already surrounded by four whale sharks. They’re bigger than our boat! I dove excitedly to join him. I started taking pictures underwater. Using only a dicapac case for my SLR, I struggled to take good photos. One of the boatmen offered to take our pictures and I did not hesitate to hand him my camera. 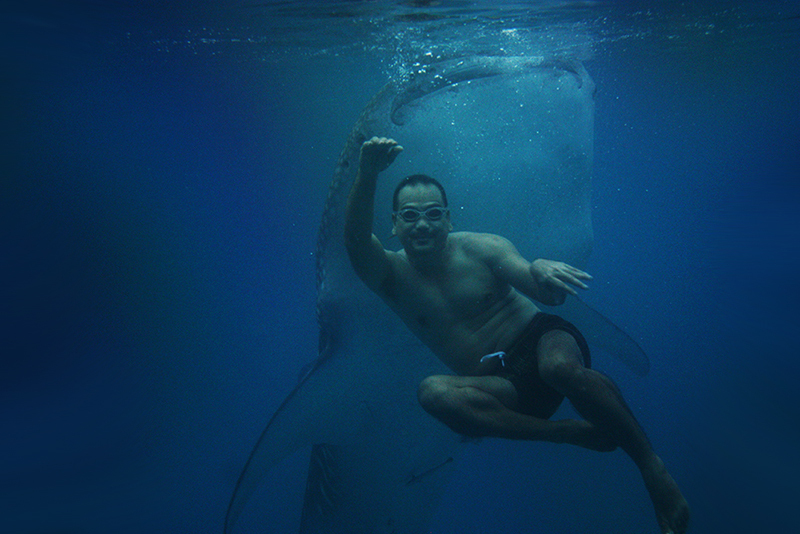 After giving him a few instructions on how to use the camera, I snorkeled to see the whale sharks. The water was crystal clear and the view underwater was spectacular. It felt like watching Nat Geo Channel on a giant screen, maybe even better. It was like I had been plunged into a different world. The whale sharks are really gigantic. We were told to keep a distance of at least 5 meters away from them but they were swimming around us so near, so close that I feared I might kick one of them accidentally while swimming. At some point, one of them swam just right beside me that I felt its skin touched my arms. While I was full of excitement, I must admit that I felt a little uncomfortable for a while. I know it’s safe, that they do not eat humans, but their size really made me feel apprehensive.I got back on the boat and rest for a few minutes. I saw that two more whale sharks came in to join the party. Meanwhile, Jim was having a great time. 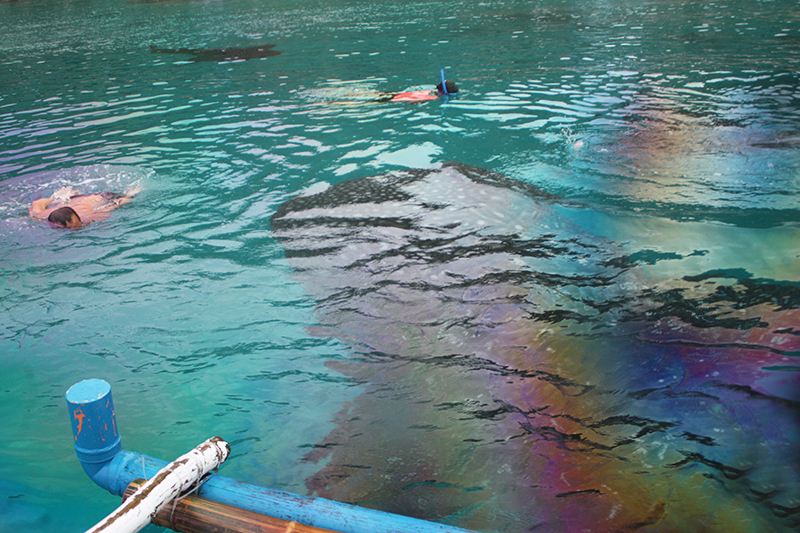 At that instant, the boatman called my attention and said,” Ayan na yung pinakamalaki (There’s the biggest!) 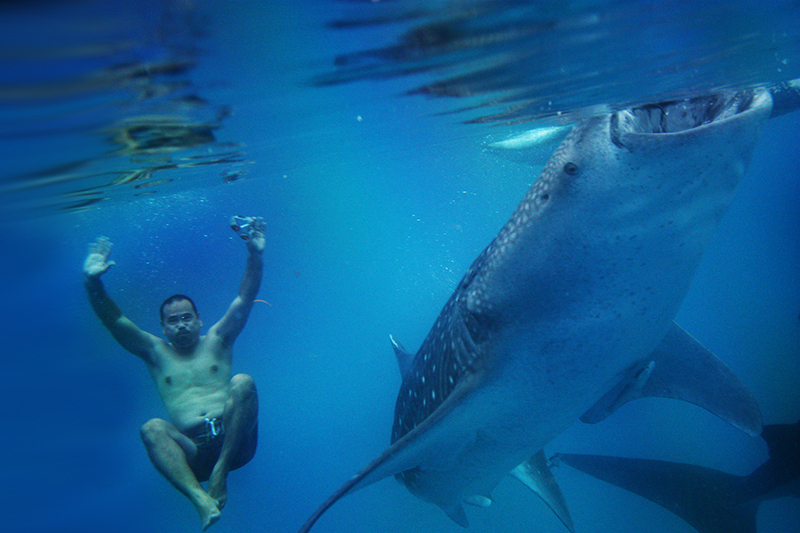 He was pointing to an enormous, Ceres bus-sized whale shark swimming towards our boat. All the anxiety that I felt turned into excitement at once. 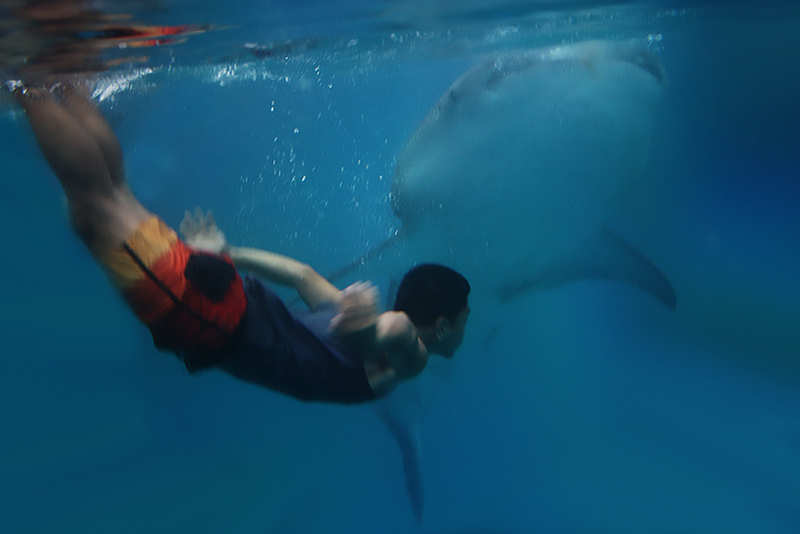 In a matter of seconds, I was underwater again, watching, swimming, and totally enjoying my time with the whale sharks of Tan-awan. The experience was simply A-M-A-Z-I-N-G! 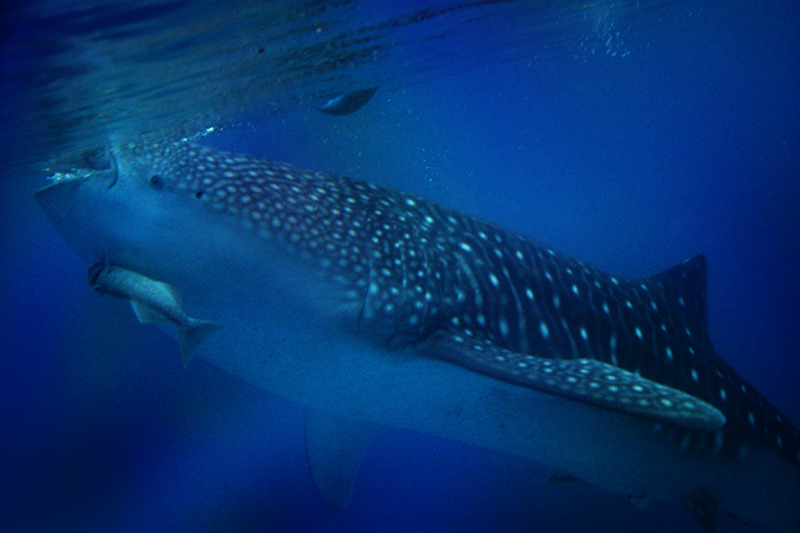 Just as more whale sharks started to appear, other tourists began to arrive. Our 30-minute paid encounter with the gentle giants was also almost over. After one more glance of the whale sharks underwater, we hopped on the boat and went back to the shore. 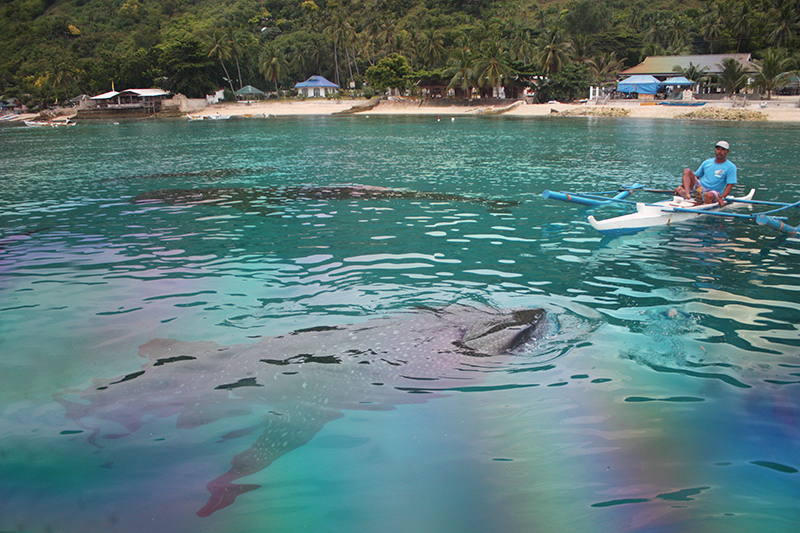 CHEAP ACCOMMODATION IN TAN-AWAN, OSLOB: Although there’s a lot of hotels in Oslob town proper, it is best to look for accommodation in Barangay Tan-awan, where the whale sharks are being fed. Fan room would normally cost P800.00 while air-conditioned rooms are priced at P1,500. 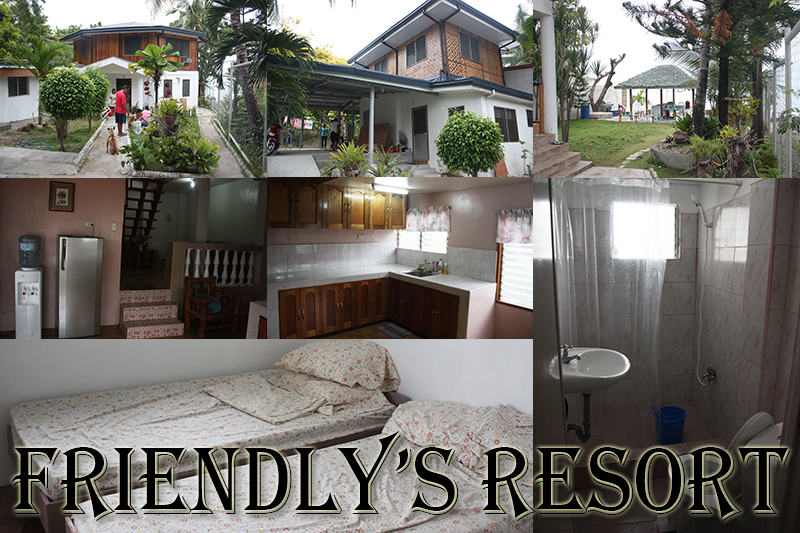 During our trip, we stayed at Friendly’s Resort, a homestay type of accommodation. We were charged P800.00 for a fan room with two single beds. The price was basically the same as that of the other resorts nearby but what made us choose them was that they allow their guests to cook. I highly recommend Friendly’s resort specially to families and groups. If you’re traveling alone, they could also provide you space for P400.00. And if you brought your tent with you, they would allow you to set up your camp near the beach. Kuya Jimmy, the houses’ caretaker who is also a barangay kagawad is very nice and accommodating. With his help, the entire process of the tour would be much easier. During our stay, we had the chance to meet the owner of Friendly’s, Ms. Grace Dunnet and her husband Doug, who were on vacation that time. We were very much impressed by their hospitality. Very nice couple. We were treated like old friends. We felt as though we were spending time with treasured friends. For your inquiries and reservation, please contact Kuya Jimmy at 09334886886 or you can add Friendly’s on Facebook. FROM DUMAGUETE CITY TO TAN-AWAN, OSLOB: While we were at Tan-awan, we realized that getting there is easier and faster via Dumaguete City. 1. From Dumaguete City, you can either hire a tricycle or ride a bus or multi-cab/jeepney to bring you to Sibulan Port. Travel time and fares: Depending on your mode of transportation, travel time is approximately 15-30 minutes. Chartered tricycle costs P150.00, good for 4 persons. Ceres Bus: P20.00; Multi-cab/jeepney: P11.00. Make sure you look for Ceres buses and multi-cabs with Sibulan signboard. From the Sibulan bus stop, you walk for 3-5 minutes to get to the port. 1. Day trip to Sumilon Bluewater Island Resort. Probably the best island resort on this part of Cebu, they offer day trips for Php1,500 on weekdays and Php2,000 on weekends per head. This includes lunch, boat transfers, use of swimming facilities and island activities such as snorkeling kayaking and trekking. Ride a public jeepney or habal-habal from Tan-awan to get to Bancogon port, where Bluewater Sumilon Island Resort’s private boats are located. Travel time is approximately 5 minutes. At the port, register for a day trip. You will then be transferred to the island resort for 15 minutes. Boat transfer to and from the resort is included in the package. A cheaper way to get to Sumilon island is by renting a pumpboat. The pumpboat costs Php2500.00. You can only stay at the sandbar though. 2. Spend the rest of the morning at Tumalog Falls or otherwise known as Toslob falls, then head to the center of the town to visit Oslob’s heritage sites. 3. Do what we did. 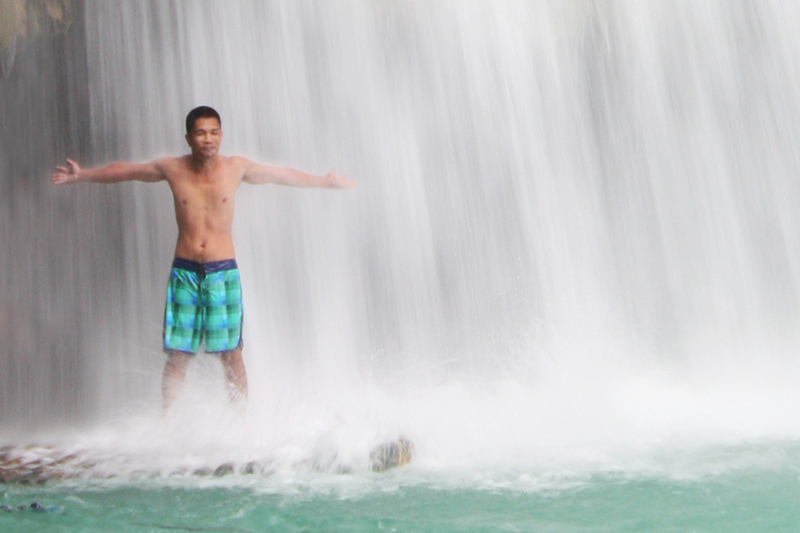 Travel straight to Badian and enjoy the heavenly invigorating waterfall massage at Kawasan falls! di ba nakakatakot baka malulon ka ng isda hehehe, nice blog friend.. enjoy reading it..
may konting kaba din, hehe. pero they’re safe naman. wala pa naman daw nilulon na tao, lol. I enjoy reading what you wrote about your trip in Tan-awan. Comeback anytime we will be happy to accomodate you and your friends. Thank you for featuring Friendly’s Resort, our small hideaway in South Cebu. We want to keep it “homey” for everyone to stay. Glad you like it and thank you so much for being so nice and accommodating during our stay at Friendly’s. God bless! hi How much do friendly’s resort charge if we bring our own tent? Hi there! Super timely ng blog mo as I will be going to Cebu this Friday. Sir ask ko lang kung mangggagaling kami straight from Airport anu mas dapat ko unahin yung tanawan then sa kawasan falls? kase maaga ang arrival namen sa Cebu eh mga 7am. Or it will be great if you can suggest the DIY itinerary. Thnk you sir! i would like to view the whale sharks too and will visit there next week, is it possible to still get into the water to have a better view of these gentle giants even if i dont know how to swim? Hi Sir! 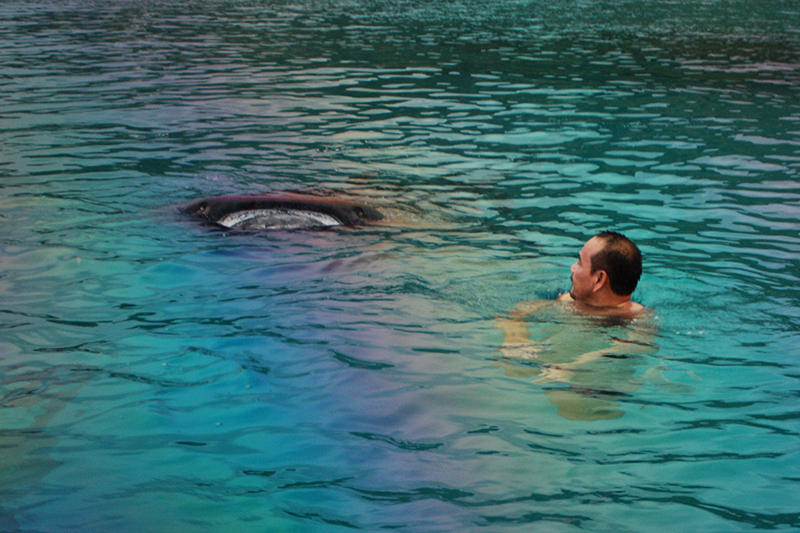 Can you tell me exactly how you traveled from the whalesharks all the way to Kawasan Falls? I would be travelling there on October and my plan is to first go to the whalesharks then to Tumalog Falls then straight to Kawasan Falls. However, I still don’t know yet how to reach Kawasan Falls located in Badian. Thank you 🙂 Nice blog, btw. Is Brgy Tan Awan different from Bancogon? Good day! This is Paula Bianca Brocka. 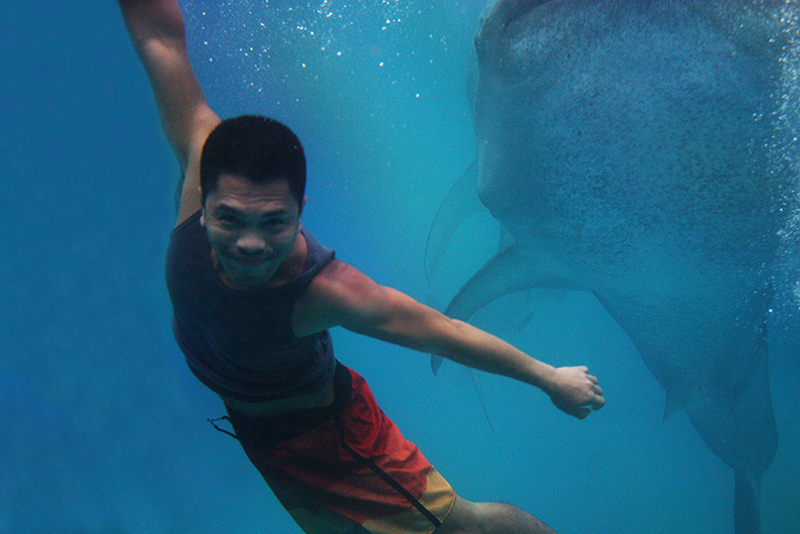 May I know if you availed package for Oslob (whale shark watching) and Kawasan (Canyoneering)? Or just DIY? Because I’m planning to go in Cebu on July.. Need to budget my money wisely.. Is it okay to get tour package for Oslob-Kawasan? Or just go there within my preferred date without reservation for that kind of adventure? Will someone entertain us? Or need to book ahead of time? Any suggestions please? Thank you. Good day! This is Paula Bianca Brocka. 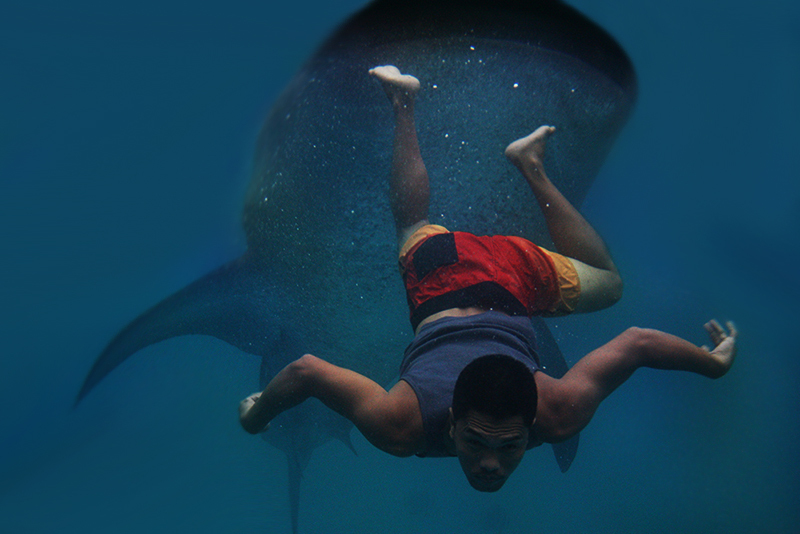 May I know if you availed package for Oslob (whale shark watching) and Kawasan (Canyoneering)? Or just DIY? 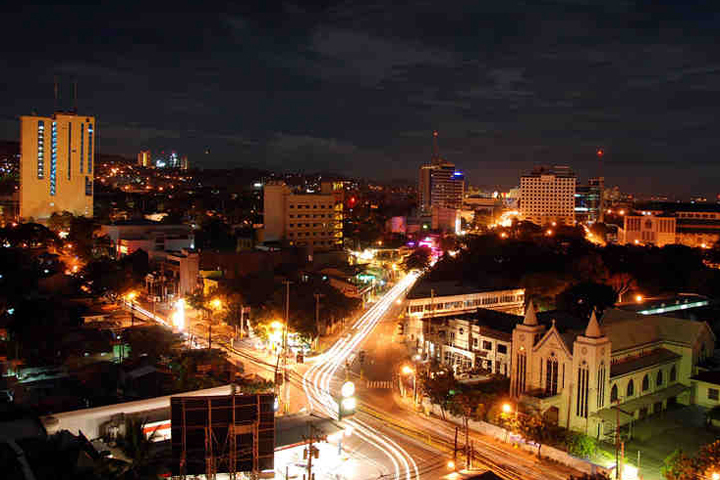 Because I’m planning to go in Cebu on July.. Need to budget my money wisely.. Is it okay to get tour package for Oslob-Kawasan? Or just go there within my preferred date without reservation for that kind of adventure? Will someone entertain us? Or need to book? Any suggestions please? Thank you. I am planning to go there also. I am planning to go on July 12-13 in Canyoneering. 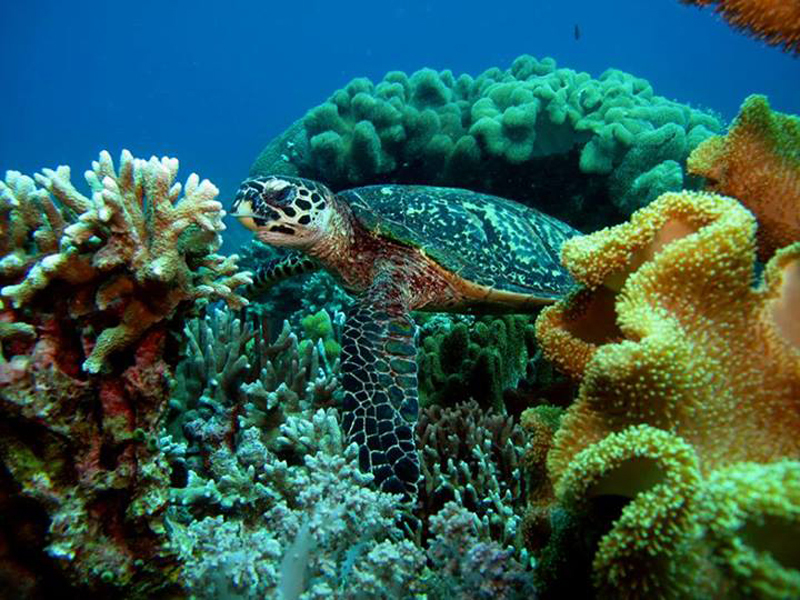 Hi Very useful po ng blog mo.. Dami ko nakuhang tips and ideas for our Oslob trip.. Thanks a lot! we will visit cebu next month sept 1-4 and we’re excited to meet and greet the whales ..
Is friendly’s resort just walking distance from the orientation hall? How many minutes away is it by foot? Or do we still need to ride a tricycle?